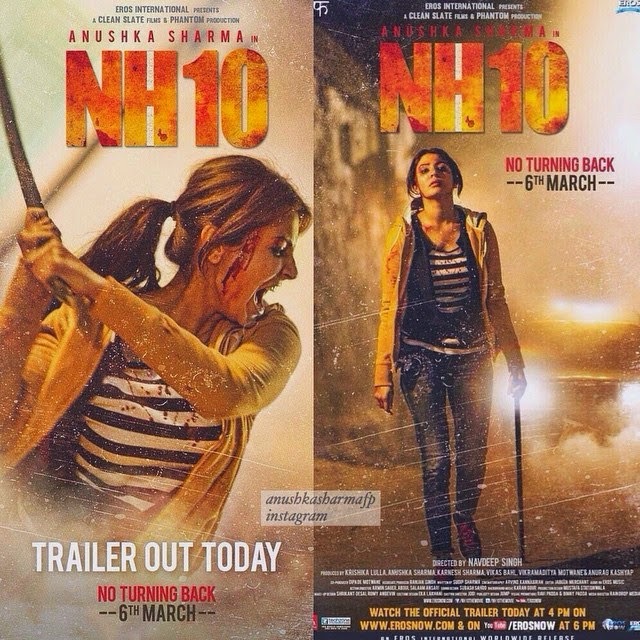 NH10 must be Anushka Sharma's best performance so far, i feel. The story is intense, violent and gripping in a way that i didn’t feel it was filmy with usual Bollywood masala at any point. The movie touches upon a very important and disturbing topic, honor killing and extreme ideologies still present in rural India. I am not going to reveal the story with any more details, you should watch it. Not a typical Bollywood movie, when all the Bollywood actresses are trying to doll up their looks and becoming 'Roop ki rani' off and on the screen, It takes quite a few guts for Anushka to do this. She does it so well that it doesn’t look made up. It is truly commendable that Anushka chose to do this movie at a early phase of her career, really needs guts. Anushka portrays the helplessness, fight to escape, struggle to survive and save, avenge and revenge quite effectively. She steals the show. The movie conveys the message convincingly. Right from the beginning, the movie kept me on the edge of my seat. Movie does raise few hard questions, Are women safe? Should women protect themselves? Are ideologies important than someone’s life? With important questions raised, Are women really safe? The answer is may be or may be not. Women need to protect oneself, is the only option. I am looking forward ton watching this movie..and Anushka is surely a versatile actor ! hats off to her for such a fabulous performance ! Nice brief review of the movie...on the list to watch. You forgot to mention the star attraction - the white classy toyota fortuner! Yes, it is indeed a supperb thriller. Thumbs up! good iphone jailbreak, the other is utilizing Safari approach. vShare for Android Download Free & Pro Version PC and from that we will mount it to your iphone device. nice.